If you want to retire someplace that isn’t too crowded and beautiful, Montana is the place for you. In this state, you can be sure that you’ll feel more comfortable and enjoy your privacy since your closest neighbor might live as far as a mile away from you, with plenty of empty space in between. This equates to less traffic, so you don’t have to worry about your safety that much. The Treasure State is full of rodeos, gorgeous views, creeks and rivers, and gentle nature that everyone can enjoy in. If you’re considering Montana for retirement, you will probably want to get informed about this state’s senior living costs, facilities, and benefits they have to offer to their residents. In order to make your decision making easier, we have collected the most essential information about the senior living options that are present in Montana, be it independent living of assisted living, including the various support systems that have been put in place, as well as the amenities they have to offer their residents. If you already have a general idea about which city you’d like to retire to, feel free to use our list of cities below and find the closest senior living option to the city of your choice. Boasting a housing index of 102.80, Montana is a bit more expensive state to live in, when compared to the national average of 100, but it’s not too expensive. This state has many things that people of all ages can enjoy in, should they choose to do so. One-bedroom apartments in Montana have an average monthly cost of $596, compared to the national average of $825. Two-bedroom apartments go for the average price of about $754 per month, compared to the national average of $1,027 per month. That being said, let’s focus on the monthly living costs for seniors in Montana. The home healthcare costs in Montana average out at around $4,382 per month. This price gives seniors access to service aides that provide help with housecleaning, daily tasks, and meal preparation, allowing them to enjoy the comfortability of their own homes. Adult daycare facilities in Montana have an average monthly cost of approximately $2,582, providing housing during daytime, as well as access to various social activities and therapies – when needed. This type of senior care is best suited for seniors that are still active and healthy but could benefit from some socialization. Do keep in mind that adult daycare facilities don’t offer extensive care, meaning seniors that require a increased level of care should turn to some other forms of senior care like nursing care or respite care. For seniors that require an increased level of care and help with daily tasks, assisted living facilities operate all over Montana. Assisted living facilities in Montana have an average monthly cost of about $3,650 and this price gives seniors access to personal care and health services. If you are a senior that needs 24/7 care and supervision, you should check out some of the many nursing homes available in Montana. These nursing homes have professionally trained nurses and staff that can provide all the care that seniors need, allowing their primary caregivers to take care of their daily obligations with a peace of mind, knowing their loved elderly are in good hands. Semi-private rooms have an average monthly cost of about $7,209, while seniors that prefer more privacy can opt in for a private room, for the average monthly cost of $7,972. No matter which option is chosen, residents at these nursing homes will be provided help with personal care, medications, ‘round the clock skilled nursing care and supervision, including therapy and rehabilitation – as needed. Many baby boomers dreaming of open space in the American West choose Montana for retirement. White Fish and Helena are just a couple of popular areas that seniors choose to spend their golden years at. These two areas, and many others have lots of benefits to offer their residents, Below, we have listed three of them. Because of the scarcely populated areas in Montana, seniors shouldn’t be too concerned about traffic and safety. People here can take pleasure in driving for hours on end when traversing the deep green forests and wide, open vistas. The views that these roads provide are free of human-made buildings almost everywhere, including lakes and rivers that have clear water that can’t be found anywhere else. Additionally, if you’re an avid hiker or outdoorsy person, you’ll be glad to find out that the nature present in Montana is quite gentle and won’t try to bring any harm to you. The state has 10 kinds of snakes that are indigenous to this area, and only one of them is venomous – the prairie rattlesnake. Montana is home to two of the largest and most beautiful national parks in the nation. Firstly, there is the world-famous Yellowstone, filled with gorgeous mountains, waterfalls, and indigenous wildlife. A part of Yellowstone can be viewed from the southwester border of Montana. Secondly, there is the Glacier National Park, home to a plethora of national marvels that have survived the test of time. These two, and many more natural beauties are open for exploration to everyone, including seniors, allowing for hours of exploration along the curved roads that run through the national parks and many hidden areas that no man has stepped in. There are many smaller towns that can be found all over the state, and because of their sparse population, neighbors have gotten used to help each-other whenever it is needed. This means that even though they aren’t that close in proximity, they will occasionally check in so as to make sure their neighbors are ok or provide some assistance if needed. There is a plethora of senior living options in Montana. Seniors that choose to retire in this state have several options when it comes to retirement, and these include independent living, assisted living, memory care, and nursing homecare. Since the choice you make depends in your own personal needs and wants, keep reading to find out which one of these options is best suited for your lifestyle. There are over 68 independent living facilities operating all over Montana, and their primary goal is to provide assistance to seniors that are still active and healthy, without the need of 24/7 nursing care. The average monthly cost range for independent living facilities in Montana can be anywhere from as low as $825 to as high as $3,222. Seniors that prefer apartment living can opt for living in an active senior community for seniors aged 55+ or 65+. Active senior communities often have several useful amenities to offer their residents, and some of them include gyms, walking and hiking trails, clubhouses, meeting rooms, pools and jacuzzies, and much more. Montana is home to over 140 assisted living facilities operating statewide and providing seniors with professionally trained caregivers, quality healthcare, and access to many social and local activities. Family members will be at peace of mind knowing that their loved elders are living comfortably with the help provided by these facilities in terms of housekeeping, laundry services, transportation, meal preparation, and ‘round the clock surveillance to guarantee their safety. Assisted living facilities in Montana have an average monthly cost range of anywhere from $1,500 to $5,959, a price determined mainly by the location of the facility or the level of care provided. The more affordable facilities can be found in the Billings area, while the most expensive assisted living facilities are located in the Missoula metropolitan area. Montana is home to a large number of memory care centers. The main goal of memory care centers is providing care to seniors that have been diagnosed with Alzheimer’s, dementia, or dementia related ailments with the help of professionally trained staff that helps with daily tasks, or providing assistance when seniors forget where they are and have an emotional breakdown. These facilities have specially designed corridors and rooms, which also minimize the risk of residents getting lost. 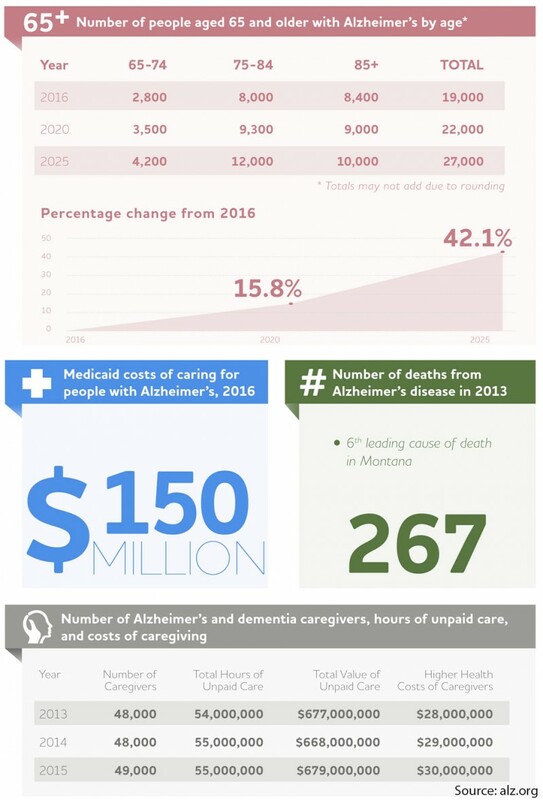 Overall, memory care centers in Montana have an average annual cost of $57,420, with monthly costs ranging anywhere between $2,175 and $8,495. The most expensive memory care centers can be found in Missoula, with an average monthly cost of up to $9,900, while the more affordable ones are located in Billings and the surrounding areas, with an average monthly cost of $1,650. While Montana is among the largest states in the nation, it’s also one of the most sparsely populated ones. For example, a small state like New Jersey might have almost 1,000 senior living providers, but Montana has only 237 of those, located amid the sparse small towns. There are 25 adult daycare centers that can be found in Montana. These centers have an average annual cost of $21,320. The more affordable ones can be found in the Great Falls area, with an average annual cost of $17,638, while the most expensive ones are located in the Missoula metropolitan area, for the average annual cost of $24,960. Seniors that have been diagnosed with a terminal illness have 38 hospices to choose from in Montana. Hospices provide their residents with medication so as to lower the pain brought about by their illness, making their stay at these facilities as comfortable and pain-free as possible, and some of them might also include various therapies like aromatherapy. Hospices also provide grief counseling for both the senior and his family, something that is much needed during this emotional transition. The costs associated with hospice care are often either partially or fully covered by Medicaid, Medicare, and private insurances. The only prerequisite for this is that the senior must be diagnosed by a doctor that states the patient has a maximum of six months of life remaining, but this can be extended in some cases. The administrative staff at these hospices will also provide assistance with all the paperwork required to make the senior eligible for cost coverage. Apart from grief counseling for emotional pain, hospices often offer chaplain services for their residents’ spiritual needs. Because of the sparsely populated areas in Montana, it’s usually very difficult for family members to provide care for their loved elders. For this reason, there are 79 respite care facilities operating all over Montana. Respite care facilities provide temporary housing for seniors whose primary caregivers need some time to recuperate and take care of their own duties and obligations as they are often family members that are usually unpaid. Respite care services can be administered either at a specialized facility or the senior’s own home. The average annual cost for respite care in Montana is approximately $73,365, with monthly costs ranging anywhere from as low as $7,395 to as high as $13,050. The price for respite care might be a tad high, but the services provided are well-worth it. Assisted-living-facilities.net will help you to find the best quality Assisted Living facilities in Montana. You can also find skilled nursing, memory care facilities, retirement communities and assisted living regulations in Montana. Here you can compare ratings and check prices and costs for assisted living. Read reviews and more, with the best directory for Assisted Living Facilities. The state of Montana has 244 assisted living facilities. If you're searching for information about assisted living communities in Montana, you need to look no further! Assisted-living-facilities.net will provide you with the most comprehensive information about the number of 244 assisted living facilities for seniors that are currently available in Montana. The assisted living services available in Montana include in-home residential and assisted living situations, nursing homes, retirement communities, adult day care, and a range of independent living situations, you can also find Alzheimer's and hospice care. Searching in Assisted-living-facilities.net to find information about Montana's assisted living communities is simple! You can use the site in these ways to search and find the assisted living facility or community that is the right one for your needs, and allows you or to your loved one, to live close to friends and family and to enjoy fully. Getting all the support of the amenities that Montana has to offer. The average monthly starting costs for assisted living facilities in Montana (higher for residents requiring memory care) starts and depends on the level of care the resident. The average monthly cost of assisted living in Montana starts from $1,500 to $4,500.